Channel 5 is close to officially unveiling its new look, in the first major revamp for the station since US media giant Viacom bought a majority shareholding in the broadcaster in 2014. 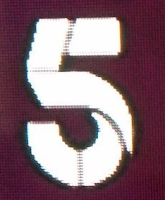 And thanks to some premature alterations to catch-up service Demand 5 on Virgin Media, viewers were given an unofficial first glimpse of the new logo for the channel (low res version pictured), which is expected to arrive on-screen next month. So far, the reaction on social media to the new logo, which consists of five elements making up the number 5, has been mixed or negative, although how it will actually look on screen remains to be seen. On Friday 8th January, contractors for Channel 5 were out and about in Glencoe filming new idents for the channel. According to a report by The Press and Journal, the crew had to use a rain machine to film the ident: they hadn't banked on it being a sunny day in Glencoe. The new look appears to be roughly coinciding with the demise of BBC Three's linear TV service - the rebrand, first announced by Viacom in March 2015 - was originally due to hit our screens last autumn, when BBC Three was originally due to become online-only. Changes to Channel 5's timeshift channel Channel 5+24 have already been revealed: the channel will from next Monday show Channel 5's daytime schedule (except news) 24 hours later - until now only the post 7pm schedule has been timeshifted, although listings for the Freeview version of the channel released thus far don't yet show any extension. Since Channel 5+24's launch in February 2014, the service has operated different schedules on satellite and cable to that on Freeview. And Channel 5 has confirmed that it will be showing the newly revised US series The X Files from Monday 8th February at 9pm.